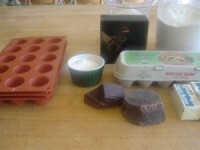 To get ready, preheat the oven to 350 degrees, and set out the molds. 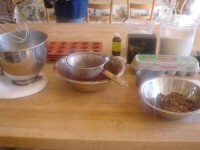 Sieve the flour, cocoa, and salt together into a bowl. In the bowl of an electric mixer, beat together the eggs and sugar on medium speed until they are thick and lemonly looking. Add the vanilla. With the mixer on low, alternately add one-third of the dry ingredients and one-third of the melted butter. 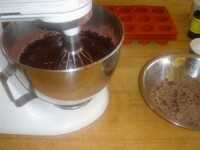 Add the chocolate pieces and stop the mixer. Spoon the chocolate mixture into the molds filling them almost to the top. 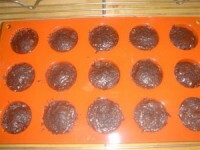 Bake in the preheated oven for about 20 minutes, until the tops look shiny and set. 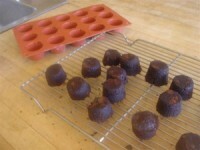 Transfer the molds to a cooling rack. Let them cool 5 minutes before turning out onto a rack to cool. 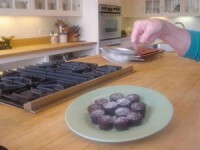 Just before serving turn them over and dust with a light sprinkling of confectioners’ sugar.